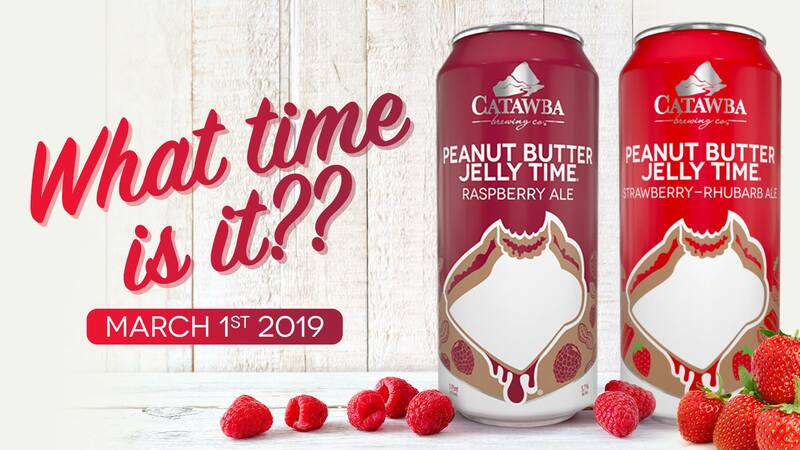 (Morganton, NC) – The legendary “PB&J sandwich in a glass,” Peanut Butter Jelly Time (5.7 percent ABV), makes its annual return to the Catawba menu on March 1 with a weekend release party. The beer starts as a light brown ale with a touch of wheat in its malt bill, providing the bready base for the star ingredients – real raspberry puree and whole roasted North Carolina peanuts. Continuing a new tradition started last year, the release party for Peanut Butter Jelly Time will include three specialty variations of the beer in addition to the original Raspberry: Strawberry-Rhubarb, Blackberry, and the debut of Black Currant.